Attempt to breach Israel's naval blockade of Gaza ends without violence, ship escorted to Ashdod. Israeli troops on Saturday boarded a boat carrying anti-Israeli politicians and activists seeking to run Israel's naval blockade on the terrorist enclave of Gaza, the IDF said. The operation, which the military said was concluded peacefully, ended the latest bid by activists to breach Israel's maritime embargo on Gaza which prohibits all naval traffic in and out of the Hamas-run coastal territory. "A short while ago, Israeli navy soldiers boarded (the MV) Estelle, a vessel which was en route to the Gaza Strip, attempting to break the maritime security blockade," the IDF said in a statement, indicating the Finnish-flagged vessel was being led to Ashdod port in southern Israel. "There was no violence," a military spokeswoman told AFP, saying troops had taken control of the 53-meter (174-foot) vessel. "The passengers did not resist." On board the ship are 17 passengers, among them five parliamentarians from Europe and a former Canadian lawmaker, organizers said. It was also carrying a shipment of alleged humanitarian aid and 30 doves, which the passengers had been intending to release on arrival in Gaza. The announcement came shortly after organizers told AFP that the ship had come "under attack" after being approached by navy vessels some 38 nautical miles off the Gaza coast. The IDF said the boarding was carried out only after "numerous calls to the passengers onboard" which went unanswered. "As a result of their unwillingness to cooperate and after ignoring calls to change course, the decision was made to board the vessel and lead it to the port of Ashdod," the military said, indicating that troops "did not need to use force." On arrival at Ashdod, the ship's passengers would be handed into police custody and then onto the immigration authorities for immediate deportation. 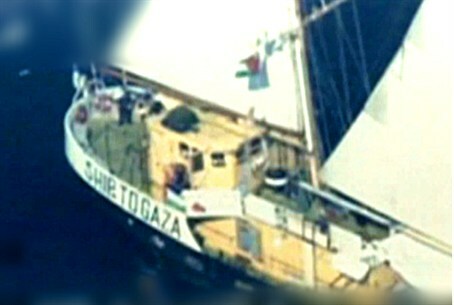 The takeover of the MV (Motor Vessel) Estelle was quickly denounced as "piracy" by Gaza's savage Hamas rulers.